My mother shared this worn recipe card with me because it’s labeled as “The Hess Special” and came from my great-grandmother Olive Edna (Hess) Hill. I haven’t baked this simple looking cake yet, although I did ask mom what temperature a “moderate oven” should be. 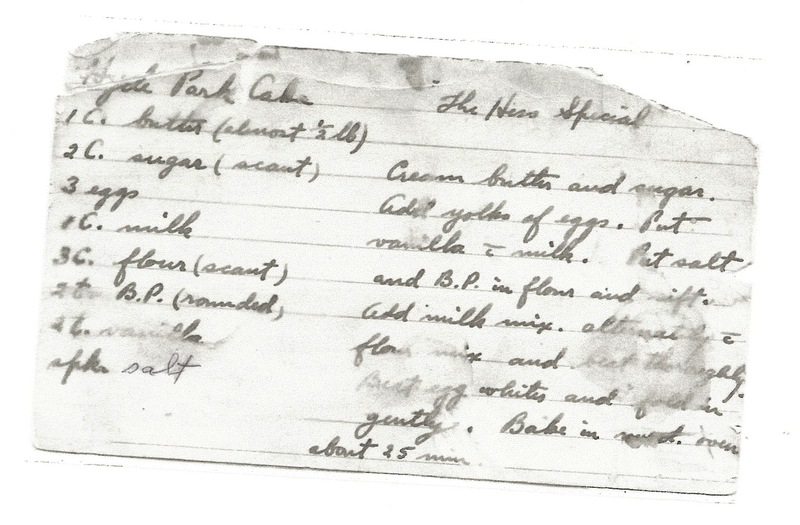 The thing that thrills me about something as simple as a beat up old recipe card is that this cake was something special to my great-grandmother and that it’s (most likely) in her handwriting. It could be my grandmother’s writing, but comparing it to other items I know are hers this is a bit different. I am amazed—when comparing handwritten items—how similar both male and female ancestors writing style is to my own, or that of my siblings and mother.